Ken Strutin (J.D., M.L.S.) is an experienced law librarian, criminal defense attorney, and well-known writer and speaker. 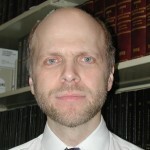 He is the author of The Insider's Guide: Criminal Justice Resources on the Internet, and has lectured extensively about the benefits of using the Internet for legal research at national and local CLE training programs. Mr. Strutin also wrote ALI-ABA's Practice Checklist Manual on Representing Criminal Defendants, and co-authored the award winning Legal Research Methodology computer tutorial, published by the Center for Computer-Assisted Legal Instruction (CALI). He has contributed chapters to several books and written many articles concerning knowledge management, legal research and criminal law. Mr. Strutin has taught courses in Advanced Legal Research and Law Office Management. He is also listed in Who's Who in American Law. Currently, Mr. Strutin is the Director of Legal Information Services at the New York State Defenders Association and writes a column on technology and criminal law for the New York Law Journal.